School’s out and the coolest people know that high-summer festivals are the place to be. Whatever your passion, there’s an event to suit, and thanks to the surging popularity of boutique festivals ‘roughing it’ is no longer obligatory. If your tickets are booked but you’re not sure what to pack, this style-centric guide will help you hit the perfect pitch. If you’re a culture vulture, head to an arts festival to get those creative juices flowing. Wilderness, from August 2-5 in Oxfordshire, celebrates the arts in a stunning, scenic location with an open-air theatre, life drawing sessions, dance classes and wellbeing workshops. Inspired by nature, arts festivals have a retro, hippie vibe, so this is the place to parade your bravest boho looks: flowing silk summer dresses, floral maxis, linen trousers, cotton kaftans, Indian gauze tunics, tribal waistcoats and lots of jewellery. Staying in a boutique area adds to the boho chic at an arts fest: splash out on a yurt, luxury bell tent, cabin, tipi or even a gypsy wagon. Most upscale festival campsites include bedding and towels, but you can use the extra space in the car for plump pillows and fluffy throws, adding your flair for interior design to the festival mix. To find your inner flower power, try a music festival: Green Man, (if you can still get tickets) from August 16-19 held in the Brecon Beacons, attracts all ages and offers a stress-free experience in Tangerine Fields, a camping village with tents and tipis pitched and ready to sleep in. The atmosphere at music festivals tends to be relaxed so think casual (cut-off jeans and cropped tees; denim dungarees over a bralette; floral shorts with a faded vest-top) with pops of bright colour and perhaps a smattering of eco-friendly glitter. ‘Glitter bums’ might be a 2018 festival trend filling feeds on instagram, but we’d obviously opt for a classier, less cheeky application. Even if the summer is still sizzling, take at least one oversized cardi to wrap-up in during the evening and don’t forget your raincoat and (designer) wellies. 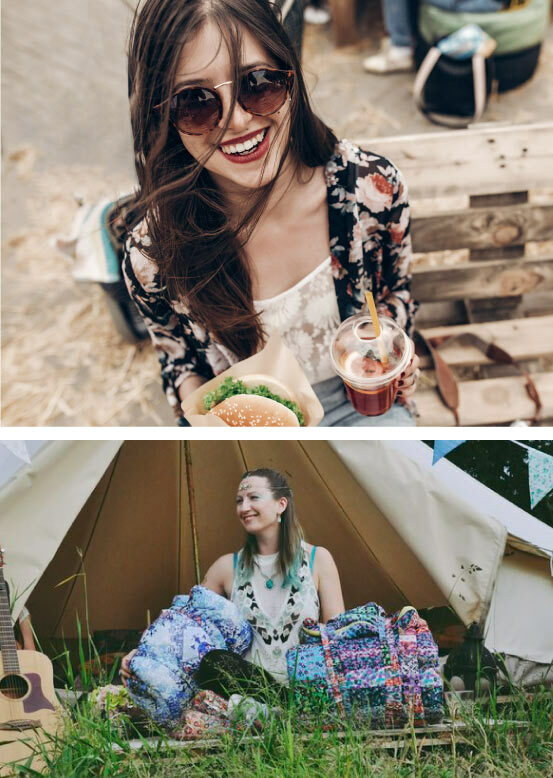 Sitting out under the stars and listening to the strains of a DJ’s tunes from the dance tent is a must, so make room for a couple of stylish wool blankets that you can send off to Laundrapp for dry cleaning when the music’s over. Foodies can revel in tastes conjured by the world’s greatest chefs and producers at a food and drink festival – and digest their delicacies to the tune of live music and comedy. In case you didn’t know, Alex James, Blur’s bassist, is a massive foodie. Famed for the cheese he makes on his farm, he hosts The Big Feastival, from August 24-26 in the Cotswolds. A-list foodies on the 2018 bill include Mark Hix, Gizzi Erskine, Annabel Karmel and Raymond Blanc. When you’re dressing for a food festival, comfort is key, but outfits including a cute printed tea dress with sandals, high-waisted shorts with a retro-print vest, a smart one-colour playsuit with flatform trainers and linen shorts with a matching shirt are staples. Food festivals tend to be smaller scale, so glamping options may be limited but you could splash out on plush bedding. Sleeping Beauties sells a collection of sleeping bags in stunning prints, beautiful enough to come home at the end of a festival and be used as a throw or extra bedding rather than being stored away and forgotten about. Festivals were once the preserve of flighty young things with flowers in their hair; today, they appeal to all ages and are hugely popular with families. Festival No.6, from September 6-9 in Portmeirion, includes a Daft Funk kids’ rave, campfire karaoke, a kids’ cookery school and family yoga. There is nothing sweeter at a festival than parents and their wee ones in matching outfits – it’s one of the only places you can synch your family fashion without looking twee. Mums can look chic and sassy in drop-waist summer dresses and tunics, playsuits with flip flops, and bandeau dresses with lace-up pumps; dads can play it cool in band t-shirts with jeans and aviator sunnies, 70s-inspired silk shirts with plain linen trousers, and chic swim-shorts with a Panama hat and sliders. Pop the kids in the softest cotton shorts, tees and dresses you can find with wide-brimmed hats and lashings of SPF – and the wildest accessories to make them smile. The only downside to a family fest is the pile of washing you’ll be bringing home from the campsite. Laundrapp’s Wash, Tumble-dry & Fold service https://laundrapp.com/instant-order/items/ could be the solution: it includes one bag of laundry washed at 30 degrees with non-bio detergent, tumble-dried on medium heat, folded immediately so creases don’t form and cleverly packed in a square bag. The family’s casual wardrobe returns, ready to wear again – straight out of the laundry bag!